By taking a few simple steps, Android freelance app developers can register in Google Play and start uploading his applications to Google’s mobile market. Beyond any doubt, Google Play is one of the two big app stores that exist in the world. With over one million applications, this Android store reaches millions of users throughout the world. Therefore, registering for Google Play as an Android app developer is a critical step for anyone who wants to make a living out of app development. Likewise, registering is compulsory in order to enjoy all the guarantees offered by the Android Developer Programme. Although it may seem a cumbersome process at first, it’s not complicated to register in Google Play as an Android app developer. You just have to follow a series of steps. Have a Google account. This step is critical, as it will be linked to the Android app developer’s account. You can use an already existing one or create a new one. What’s more advisable? It depends on the use given to the account you already have. If are already using it for professional matters, you can employ it to register as an Android app developer in Google Play. If your Gmail account is intended for a more personal use, it’s preferable to create a new account for professional use, as it will be easier to separate work from personal life and take a break when you are not working. Distribution agreement for Google Play developers. Once you have a Gmail account, you must read and accept Google Play’s Developer Distribution Agreement (https://play.google.com/about/developer-distribution-agreement.html), which discloses all the standards to be met by Android app developers when distributing their work through the app store. It’s also advisable to consult the list of countries where you can distribute applications and paid-for content (https://support.google.com/googleplay/android-developer/answer/138294?hl=es), as this is not possible in all countries where Google Play is present. Payment. Registering as an Android app developer in Google Play will cost $25. And −unlike Apple’s App Store−there is no annual fee. This payment is carried out through Google Wallet. If you are not registered for this service, there’s no need to worry, as Android app developers will be able to register on the go. Having a Google Wallet account can be useful in several other ways, especially when uploading paid-for apps or contents requiring in-App purchases. Filling out the registration form. After making the payment, the user must fill out the registration form with their personal information. Once the Android app developer’s Google Play account is registered and validated, they will be able to access this data and modify it at any given moment. Following the completion of the request, Android freelance app developers will receive an email within 24 to 48 hours confirming the registration and validating their account. After receiving this notice, they will be able to access Google Play’s Android developer console through their account and begin uploading applications. Apple has a major development programme that attracts hundreds of professionals seeking to register as iOS app developers every year. App Store is one of the marketplaces generating the most benefits. Every app developer is acquainted with this fact and is looking increasingly forward to take a foothold in Apple’s competitive app market. Registering as iOS freelance app developers is simple and, after following a few steps, professionals are able to create apps for Apple’s mobile operating system and publish them on the App Store. Similar to Android, registering as an iOS app developer comes at a price. 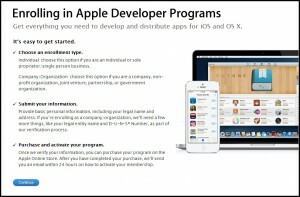 In this case, app developers wishing to register in Apple’s development programme must pay an annual fee of $99. To register as an app developer, one must go to the official website of Apple’s development programme and select the ‘Register’ option. The app developer will then be directed to a previous page where they will find a brief summary of the registration process. One must have an Apple ID to register as an iOS app developer. If the programmer is already an Apple user, he can use his very same ID for other services like iCloud or App Store. Those who do not have an Apple ID may obtain it before starting the registration process. 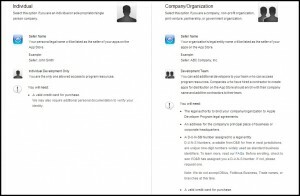 Keep in mind that both companies registered in the iOS Developer Enterprise Programme and users who have an iTunes Connect account to distribute cultural contents must also create their own Apple ID before registering. Freelance app developers or development company? To register as an iOS app developer, a professional must choose if his profile is that of an independent app developer or that of a development company. Freelance app developers. App developers not pertaining to any company or organization must only provide their legal name and a valid credit card for online payments. Also, they will be solely responsible for their iOS app developer account. Development companies. There are a few more requirements when registering as a company. A company must provide its legal name and its registered office’s address. The company must also have a DUNS number, a global business identifying the number. On the other hand, the company profile can include as many app developers as necessary, so they can access development-related resources. After this first step, it will only be necessary to enter the information requested during the process, verify the Developer Programme’s registration, accept the license agreement, fulfill the payment and activate the account.